You want to sell your real estate property? Amir Latif is not a simple residential real estate broker, he’s also working with the BLVD real estate agency, which means he is part of a highly specialized team of professionals. Such a team can offer home-sellers a lot more for their money. By hiring Amir Latif, you get to access highly targeted marketing services, such as HD photography, interactive video tours, legal protection, access to the exclusive Publicity Plus program, and to the BLVD Street Text tool. BLVD i360° fully interactive 3D tour, the absolute latest in cutting edge technology, is a game changer for the marketing of your property. As potential buyers navigate your listing room by room, these virtual tours offer unparalleled image quality with a wow factor that will keep them focused on your listing for a much longer period of time than they would by simply looking at pictures. Today, most buyers are accustomed to viewing properties online. It is obvious when a listing uses photographs that have not been taken professionally. The BLVD HDR Photography program provides sellers with professional photography services from a studio with over 12 years experience. Countless people drive or walk by your property on a regular basis and it is important to maximize the potential of this exposure. The BLVD Street Text program allows your BLVD residential real estate broker to gather high quality leads for your property. We add a texting code or a QR code on a rider that sits on top of your “For sale” sign and to your print and sales materials. This code supplies potential buyers with on the spot information and photos, therefore instantly connecting you to high-quality leads. We can easily post the listing to Facebook, LinkedIn, and Twitter, with links back to your branded listing page. Plus, this service is completely digital and eco-friendly. When a potential buyer who has driven or walked by your property texts us for information, your BLVD broker is then able to capture that person’s cell phone coordinates. This allows your broker to immediately follow up with these potential buyers. Let this powerful tool help your listing win over buyers. The BLVD Publicity Plus program is an invaluable online marketing tool to sell your property. Harnessing the power of targeted search, your property gains important exposure over many of today’s most heavily searched real estate websites. Your property becomes instantly accessible to potential buyers even if they’re not using a real estate broker. 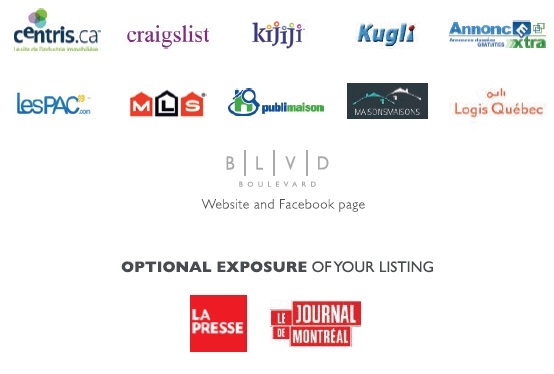 With BLVD Publicity Plus, in addition to the important MLS exposure almost every seller opts for, your property is simultaneously posted on numerous other popular real estate websites consulted daily by thousands of potential buyers.